Adding an in-law suite to your home? Call Your Project Loan! If you have family or loved ones that are moving into your home and you want to give them their own space, adding an in-law suite is a perfect solution. Follow this guide for expanding your home with an in-law suite. The first step to adding an in-law suite is choosing the right location. Survey all the rooms and areas in and around your home. The basement or porch area could be the perfect place. You may even be able to transform your garage into a fully outfitted suite. If there are no rooms or space ready to go, consider two rooms that you could knock down the ball between to convert into the suite. Depending on your lifestyle, it could be a great idea to give your in-law suite its own power and HVAC supply. This will give your family members or guests complete comfort when they stay. In addition, an added benefit is that if you ever choose to rent out the space, it will already have all the necessary systems in place for your tenants. If you have a septic tank, make sure that your permit allows for the number of bathrooms that you’ll have with the additional in-law suite. In many cases, the maximum allowable number of bathrooms is three. It might be necessary to increase the size of your system to ensure that it can support the growth of your home. Make sure that your project adheres to local building codes before you get started. Use them as a guideline for construction that they will outline the limits and what’s allowed. 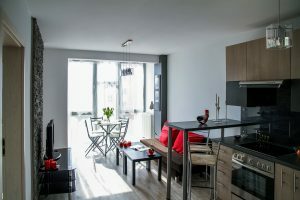 One example is that, if you install a full kitchen, the suite will then be considered an affordable dwelling unit, which requires additional permits. We know that home improvements like these are urgent matters. This is why we offer a nearly instant loan decision once you fill out our 60-second loan inquiry! We conduct business in all 50 states* and our rates start as low as 4.5%* and terms go up to 15 years! HFS Financial can help you find financing up to $200k* for your project! What are you waiting for? See your options today! This entry was posted on Friday, February 1st, 2019	at 11:56 am	. You can follow any responses to this entry through the RSS 2.0	feed. Both comments and pings are currently closed.